Fast Acting High Energy Complementary Feed Containing Nutrient and Vitamin Support for Ewes Carrying Multiple Lambs. 1. Formulated to help the breeding ewe overcome energy deficiency. 2. Includes prebiotics to enhance the immune system to protect against bacterial and infectious mircoorganisms. 3. Contains propylene glycol and molasses carbohydrates for an immediate energy boost. 4. Contains full range of essential vitamins and trace elements to strengthen the weakened immune system. 5. Built-in feeding tube with feed measure included. 6. Available in 450ml bottles containing 6 individual feeds of 75ml. 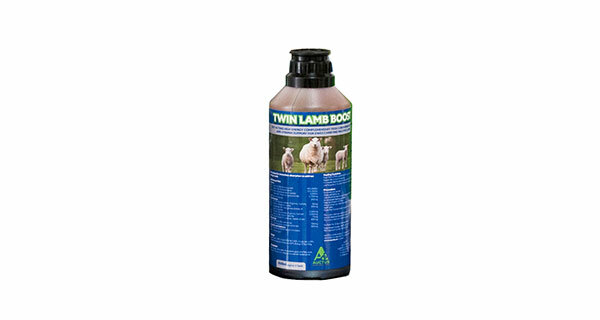 To download TWIN LAMB BOOST product information, click here.